Anytime someone wants to sell a product or service to us, we invariably ask for written information. Anytime we enter into an agreement, we want to see something in writing. Even a personal purchase is best completed with a written bill of sale that states the terms of the transaction. Your customers feel the same way you feel about written material. They want assurance that what your sales team claims is factual, and they want you to spell out in writing the benefits of what you offer. One of the biggest barriers to effective selling is the lack of clear, informative written material. Customers have only the word of a sales agent to go on, and often this simply isn’t enough. However, this all begins to change the moment you decide to write about your business and about what you can do for your customers. The fact that more people text on their cell phones than talk on them shows us that writing is more popular than ever. Think of the websites you visit and what you do when you visit them. You read. You look for information that will tell you if a product or service meets your requirements. If you do not find this information, you quickly move on to the next website. That being said, it never ceases to amaze us when we encounter business owners who hesitate to provide this type of information to their customer base. Apparently, most of these individuals feel that there is not enough to talk about when it comes to selling their business in writing. Let us assure you, nothing could be further from the truth. There are as many things to write about as there are possible customers for you to service. Article marketing empowers you to spell out in plain English what you do best and how you can improve the quality of life for your customers, clients, and strategic partners. We develop your content around the “5 W’s and 1 H of solid journalism- Who? What?, When? Where? Why? and How?. When we begin to ask questions that begin with those words, we find that we never run out of material to explore when writing about our clients. People actually Google these questions when they search online. Imagine what it will do for your sales when they find the answers to their questions on your website. 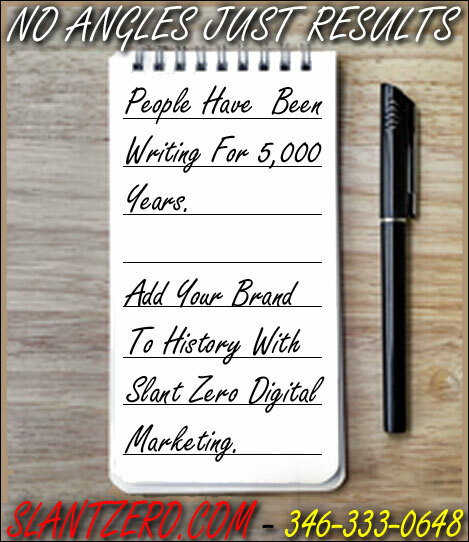 Slant Zero’s article marketing news blog makes it easy for you to do this. You tell us about your business and write the articles to spread the word about your value. If your company relies mostly upon word of mouth advertising, then you need article marketing more than anyone. People share what they read when they like it and make social media the new word of mouth. Our copywriters understand the principles of sound, factual, and informative writing. They know how to clearly spell out the benefits of what your organization delivers, and they know how to develop your content so that search engines rank your articles where your best possible customers can find you. Our job is to motivate readers to contact your sales team with a clear picture of what you can do for them. This makes it easier for your sales team to generate quotes and proposals. It also helps them close sales in a shorter period of time. We don’t use mystique or glamour to advertise our clients. We use information centered on facts that speak for themselves and put your value at center stage. Never think that you have enough articles on your website. That would be like a magazine publishing one issue with 12-15 articles and then reissuing it every month. Not only would this quickly frustrate subscriber, it would immediately make that publication stagnant and dated. Good magazines never make this mistake. They always find new topics to explore because their world is infinitely explorable. Even now in the digital age, many magazines that have been around since the 1940s continue to see new subscriptions both on paper as well as in an online form. Some of you reading this may have recently shared an article from one of these magazines to your personal LinkedIn, Facebook, Instagram, or Twitter news feed. So aren’t you doing this for your own business? If you want to be known for integrity, honest work, and A+++ delivery power, then contact Slant Zero today. You won’t get angles…you’ll get results.